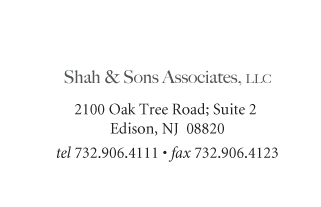 Shah & Sons is a family-owned, full-service tax consultation and accounting firm that has served both small and large businesses throughout Central New Jersey for 22 years. With former IRS auditors on staff and Certified Public Accountants having 35 years of experience, Shah & Sons can offer a wide range of personalized services for any company. Whether you're a sole proprietorship or you have several hundred employees, we can tailor our services and experience to fit your specific needs. At Shah & Sons we are proud to utilize our accounting expertise and years of experience to fit your company with services just right, no matter the size or your needs. We aim to assist you in growing your business and meeting all of your financial goals.